The answer to yesterday's mystery spot question is: Dublin, Ireland, and Ulysses by James Joyce (a big Litkicks favorite, though not necessarily a favorite of everyone at Litkicks). North of the Liffey River in the center of the city, across the street from a large hospital, you can still find 7 Eccles Street, where the novel's optimistic everyman hero Leopold Bloom lived with his wife Molly, his enigmatic cat and (presumably) an icebox full of kidneys, giblets and other strange foods which he ate with relish. Here's the house in a 1950 photo, and here's the the Google map itself. Bloom was the ultimate rootless alien in Dublin, of course, so it must have been a little joke of Mr. Joyce's to put him on a street whose name evoked Judeo-Christian religion (the root word "eccles" seems to refer to a gathering). Almost all of you guessed it right, though two people tipped me off that the answer was easily found by Googling "Mkgnao". I'll have to be more careful next time, but I'm proud of most of you for getting it right. And there's no shame in a wrong guess either. There were two hidden clues embedded in my question: the use of the word "stream" (referring, of course, to Joyce's concept of the stream of consciousness), and the repitition of the word "yes". The next Litkicks Mystery Spot question will be in about two weeks! This article is part of the series Litkicks Mystery Spot. The next post in the series is Romance in a Dry Land: Litkicks Mystery Spot #5. The previous post in the series is An Epic City: Litkicks Mystery Spot #4. 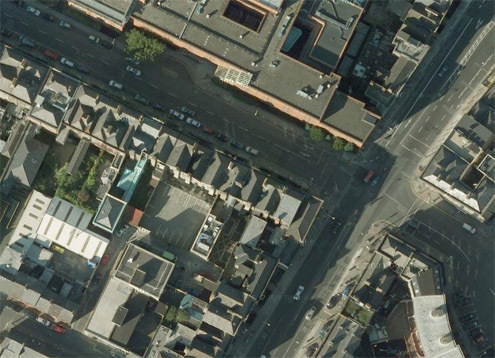 11 Responses to "Joyce's Dublin: Bloom on Eccles Street"
Dude. You know how I found the answer. I googled for "Mkgnao". Yes. You have to be more careful next time. I confess. "The Google" helped tremendously. It was a ton of fun though. Great fun. I also "Went to the Internets and got the Google," as George Bush said. Before I did that I was thinking maybe the Wake ('riverrun'). Looking forward to the next one - this is more fun than working! Shame on all you Googlers! Of course you can find anything on the web but where's the fun in a puzzle if you cheat? Resist the urge next time. The clues gave me the answer. Who else but James Joyce would have a cat say, "Mkgnao" (which is actually more accurate than "meow")? For those of you who used Google, I have one word. I think the idea is to figure it out without Google. I confess, I couldn't get it. I never read the book, so I was a little handicapped! I do like this game though. Makes you think and rack your brain. And that's a good thing. Thanks Steve. I really enjoy doing this too. I could run Litkicks on nothing but mystery spots for the rest of the year. Got the next 3 already planned. It was my fault that I left a Google-able term in the question. I avoided doing that in the first three, and slipped up this time. Good point, Dan. You weren't trying to scam anybody. In fact, it's almost second nature for me to spontaneously search the internet for almsot anything that catches my interest. I'm going to keep trying to guess without Google. We'll see how good I do. So far, not so good! These map-puzzlers are so great--thanks for them!